One's circulation can be given a tremendous boost by taking a shower and alternating the flow of water from hot to cold, back and forth. The result is invigorating and extremely healthful. 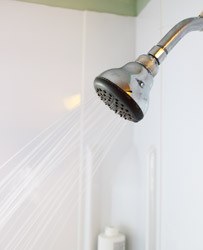 One of the main advantages of hot and cold showers is their ease of use. Wouldn't you love having a cheap easy way to improve your circulation, relieve pain, feel more energetic and revitalize your health? Hot water has relaxing properties, helping to reduce stress. Cold water helps relieve inflammation and stimulates the removal of toxins from elimination organs like the skin and lymph. Hydrotherapy is a time-honored technique that uses these properties of water such as temperature and pressure to stimulate healing and cleanse toxins. There are many different types of hydrotherapies, including saunas, colonics, and simple hot and cold showers. When the body is subjected to cold external temperatures, the flow of circulation is directed inward toward the internal organs. As the outside temperature gets hot, the flow of circulation goes outward toward the skin. Alternating hot and cold makes the circulation move in and out like and accordion. This has the effect of unblocking stuck flows, increasing the rate of detoxification and moving nutrients more readily to various parts of the body. Make sure that the water used does not contain chlorine, fluoride or other highly toxic chemicals commonly used in public water supplies. It is counter-productive to greatly increase one's circulation and at the same time drive in a large dose of toxic chemicals. If you cannot readily filter these chemicals out of the water before it comes into your home, install a shower head filter that is truly effective in this regard. We know of one sold at Home Depot for about $30 that uses replaceable carbon cartridges. Get completely wet with a temperature of water that is comfortable. Slowly increase the temperature up to the point that you can barely stand it. Quickly expose all the parts of the body to this hotter water including the top of your head and your face. Now turn the water temperature down to the coldest tolerable setting. No matter how cold the water is, at its coldest, it cannot harm you in any way. The only thing stopping you from going to the coldest setting is your ability to confront the experience. Make sure all parts of your body get this cold water exposure. Next turn the water to hot again but make it a little hotter than you had it before. Again, get each part of your body good and hot before reversing the temperature to the coldest setting. Repeat the procedure seven times - seven times hot, seven times cold. Always begin with hot and end off with cold. Make the temperatures as hot and as cold as you can tolerate. Do skin brushing using a natural bristle skin brush. Scrub yourself hard with the dry brush all over your body every day just before your hot and cold showers. This you have to experience to believe! A vigorous dry brush scrubbing over every part of the body, spending a little time on each and every part to scrub thoroughly, followed by an intense hot and cold shower will make a new person out of anyone. Use only natural soaps, shampoos and toothpastes (read the labels!) such as Miracle II soaps, since they are not toxic for you like most of the products on the regular grocery store shelves. When taking hot and cold showers, make sure that the water does not contain chlorine, fluoride or other highly toxic chemicals commonly used in public water supplies. It is counter-productive to boost your circulation while at the same time take in a large dose of toxic chemicals from the water. If you cannot readily filter these chemicals out of the water before it comes into your home, install a shower head filter that is truly effective in this regard. We know of one sold at Home Depot for about $30 that uses replaceable carbon cartridges. You may be more sensitive to temperature when recovering from an injury or fighting off an illness. You're not trying to win any competition by proving how hot or cold you can take the water. This can be done with moderate temperatures. Listen to your body, if you feel you need to stop at any time, just take a minute, sit down if you need to and see how you feel. You can use a hot and cold shower to "get into gear" in the morning or, ironically, use it at the end of the night to get an unusually restful night's sleep. If your weekdays are too busy, do this both days on the weekend for rejuvenation. Hot and cold showers can also be taken 2 or 3 times a day as a therapeutic measure to enhance the effectiveness of a natural health repair program. These showers are inexpensive, convenient, never cause any harm, and always make you feel better. Give this routine a try and see!